Deciding where and how to build a workforce is a complicated task. Shifting legal frameworks, overwhelming amounts of workforce data and constantly changing skill requirements add layers of complexity to decision-making. To execute a precise talent strategy in this everchanging business environment, workforce planning needs to move from an art to a science. 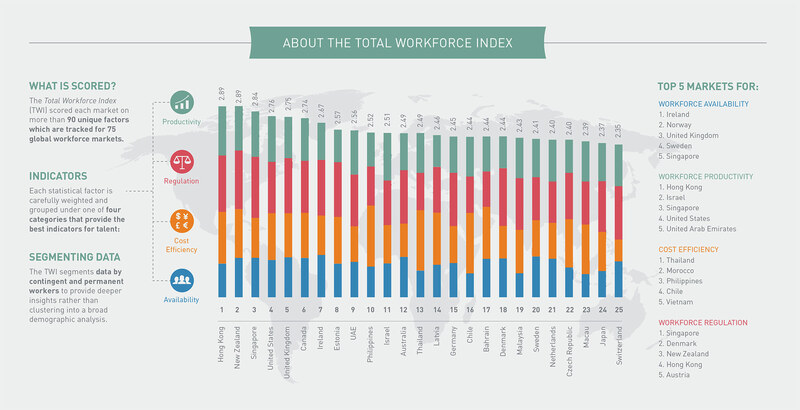 Many of the top 25 countries for workforce engagement are in Europe. Some, such as the UK, boast a mature market and more flexible regulations. Others, such as Denmark, have a less mature market. Regardless, each of these markets have secured a top-25 ranking based on above-average performance in two or more categories analysed. Nonetheless, one size doesn’t fit all, and the index can be adapted to align with an organisation’s specific requirements and priorities. By harnessing tested insight like the Total Workforce Index, organisations can execute a precise talent strategy that’s aligned to their unique needs, but that also futureproofs them against a changing world of work.